One of the most infamous vampire related mass murderers was Fritz Haarmann (1879-1925), who with his two accomplices was responsible for the deaths of at least twenty and as many as fifty young men. He was known as a vampire because of his cannibalism and habit of biting his victims in the throat. Born to a working-class couple in Hanover, Germany, Fritz was a sullen and slow-witted child whose favorite pastime was dressing up like a girl. At 17, he was committed to an asylum after being arrested for child molesting. Six months later, he escaped to Switzerland and made his way back to Hanover. Throughout his twenties, he was in and out of jail for offenses ranging from being a pickpocket to burglary. For awhile, he attempted to lead a respectable life, taking a job in a cigar factory and getting engaged to a young woman. But this period of normalcy didn't last. Deserting his fiancee, he ran off and joined the army. A child molester and homosexual, Haarmann spent time in a sanatorium after being discharged from the army. After being released he rejoined the army, this time serving with an elite group, distinguishing himself throughout World War I. A civilian again during Germany's post war era, Haarmann returned to his native city and joined a postwar smuggling ring that trafficked, among other things, in black-market beef. He also served as a police stool pigeon, a sideline that afforded him protection for his illicit activities. 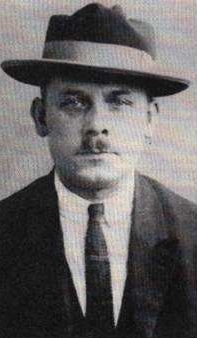 By this time he was already a murderer and then in 1919 he met Hans Grans, a fellow homosexual, who came to dominate Haarmann and lead him into the gaudy underworld of Hanover's homosexual community. Later in 1919 after being caught in bed with a young boy, Haarmann was shipped back to prison. It was after his release nine months later that Haarmann launched into his career of unparalleled depravity. Living in Hanover's seamy Old Quarter, Haarmann found an abundant supply of prey in the young male refugees who were flooding the city. He often brought young men home with him and murdered them in a grisly fashion, all under the watchful eye of Grans. Another mysterious accomplice entered the scene and aided in body disposal. The victims' clothing was sold on by Haarmann, and the most horrid of all acts was that Haarmann and Grans actually sold flesh to unsuspecting people for human consumption, peddling it as black market beef. Though Haarmann was ultimately charged with 27 murders, it seems likely he was responsible for as many as 50. The method he employed to kill his victims was always the same. After luring the hungry boy to his room, Haarmann would feed him a meal, then overpower him (often with Grans's assistance) and fall upon the boy's throat, chewing through the flesh until he had nearly separated the head from the body. Generally, he would experience a sexual climax while battering on the boy. As the number of missing boys mounted, police suspicion began to fall on Haarmann. A woman who had purchased one of his black-market "steaks" became convinced it was human flesh and turned it over to the police. In the summer of 1924, several skulls and a sackful of bones were found on the banks of the canal. Searching Haarmann's rooms, detectives found bundles of boys' clothing. The landlady's son was wearing a coat--given to him by Haarmann--that belonged to one of the missing boys. In the end, Haarmann confessed his crimes in minute detail, proclaiming insanity but declaring he was forced to commit the crimes whilst in a trance. He was tried in 1924, found guilty, and sentenced to death. While awaiting execution, the "Vampire of Hanover" (as he'd been dubbed by the press) produced a written confession in which he described, with undisguised relish, the pleasure he had derived from his atrocities. At his own request, he was beheaded with a sword in the city marketplace, ironically one of the most common and effective ways to dispose of a vampire. Afterward, his brain was removed from his skull and shipped to Goettingen University for study. Unfortunately, nothing came of this effort. Seventy years later, science is still no closer to comprehending the reasoning behind the crimes committed by people like Fritz Haarmann.